Frank Robinson accomplished as much in baseball as anyone ever has: Rookie of the Year; MVP of each league; MVP of the World Series; MVP of the All-Star Game; Gold Glove winner; Manager of the Year; Triple Crown winner; and a recipient of the Presidential Medal of Freedom. His accomplishments on the field led to his Baseball Hall of Fame induction in 1982 and recognition as one of the finest players in the history of the game. As Maxwell Kates wrote in his SABR biography, Robinson was also "one of the smartest and toughest players of his time, and one of its most renowned leaders. He earned the respect and admiration of his teammates wherever he traveled." He fulfilled a dream of Jackie Robinson in 1975 when he became the first African American manager in MLB history with the Cleveland Indians. Frank Robinson spent more than three decades as a manager, winning more than 1,000 games overall, and then worked as a high-ranking executive with Major League Baseball. The baseball legend and trailblazing pioneer died at the age of 83 on February 7, 2019, after a prolonged illness. Robinson, as Kates wrote, "would not want to be remembered as a racial pioneer. He would prefer to be immortalized as a baseball player who conducted his craft to the best of his ability in the field and at the plate." But he was all of the above — and more. His uncompromising style and relentless determination inspired everyone who played with and against him and generations of players he managed. 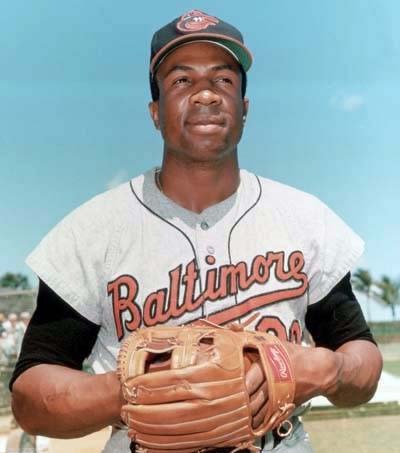 Those traits were on full display when Robinson was traded to the Baltimore Orioles in the prime of his career before the 1966 season. The infamous deal for pitcher Milt Pappas and two others — which was even mentioned in the film Bull Durham — came after Robinson had spent 10 outstanding years with the Cincinnati Reds, where he won Rookie of the Year (1956) and MVP (1961) honors and helped the Reds capture the National League pennant in '61. "[Reds general manager] Bill DeWitt’s excuse was that I was ‘an old 30,’ " Robinson told SABR member and former MLB commissioner Fay Vincent in a 2004 oral history interview. “Whatever that meant, I don’t know to this day. … I didn’t have to go there [to Baltimore] to prove anything to myself. I knew I could still play the game and the fans knew it. But I said, ‘I’ll show DeWitt.’ And I wanted to show Baltimore that they were getting a good ballplayer." With the Orioles, Robinson joined a young, talented team with Brooks Robinson, Jim Palmer, and Boog Powell, and instantly took charge in the clubhouse. On the field, he set the tone for a memorable 1966 season when he hit a home run completely out of Memorial Stadium off Cleveland's Luis Tiant in an early-season series. Robinson became the seventh American League player to win a Triple Crown by leading the league with a .316 batting average, a career-high 49 home runs, and 122 RBIs. Robinson also homered twice and won MVP honors in the World Series as the upstart Orioles swept the defending champion Los Angeles Dodgers, beginning a dynasty in Baltimore that continued under manager Earl Weaver. 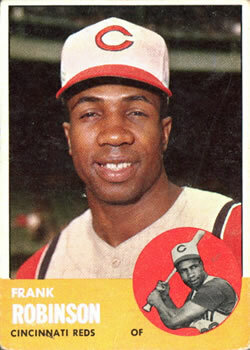 The team won three consecutive AL pennants in 1969-71, and a second World Series championship in 1970. Robinson moved on in 1972 to the Los Angeles Dodgers and a year later to the California Angels before joining the Cleveland Indians. There, he celebrated what he called "the proudest moment" of his career when he was named player-manager before the 1975 season — the first African American manager in the history of the major leagues. In his first at-bat of his first game, with Jackie Robinson's widow Rachel in attendance, Frank Robinson homered to left field in front of a sellout crowd at Cleveland's Municipal Stadium. "I hoped and wished that Jackie could have been there," he said afterward. "The next best thing was having [Rachel] there." By the time Robinson retired as a player in 1976, his 586 career home runs were the fourth-highest total in baseball history. Even today, four decades after he stopped playing, he still ranks among baseball's all-time leaders in many offensive categories. As a manager for 16 seasons with the Indians (1975-77), San Francisco Giants (1981-84), Baltimore Orioles (1988-91), and Montreal Expos and Washington Nationals (2002-06), Robinson was known for his no-nonsense style and attention to detail. He enjoyed his greatest triumph in the dugout in 1989, when he won Manager of the Year honors after leading the Orioles to within a hair of the AL East Division crown. Robinson had taken over the managerial reins in 1988 in the midst of the team's record-setting streak of 21 consecutive losses to open the season. Robinson knew from a young age growing up in Oakland, California — in the same neighborhood that produced future star athletes Curt Flood, Vada Pinson, and Basketball Hall of Famer Bill Russell — that "he would face his share of obstacles in life," as Kates wrote. "Rather than allow them to define him, he channeled his frustrations to improve his playing abilities and develop his character as a leader of men." "I played with some outstanding players," Robinson told Vincent in 2004. "I [rarely] led the league in anything in the National League [because of players like] Mays, Aaron, Clemente. But just mention me in the same breath, one time. That's all I wanted." This page was last updated February 13, 2019 at 11:48 pm MST.